Although the Premier League season has ended, football fever is still high with Euro 2016 just round the corner. For this week’s Friday Five, we’ve taken a trip down memory lane and picked some of the best football games from over the years. Share your favourites in the comments! Don’t forget: you can buy retro games from the musicMagpie Store from just £1.19! 1996 was a great year for football. England hosted the European Championships, the Shearer-Sheringham partnership was at peak power and we even managed to tonk the Netherlands. Let’s just brush that Gareth Southgate stuff under the carpet, eh? The biggest football event of the year, though, was the release of ISS Deluxe. It’s rubbish by the standards of modern soccer games but it was incredible back in the day, with loads of skills, epic goals and possibly the best (by which we mean terrible and cheesy) commentary ever. Blocked shot! Yes, it’s old and yes, it’s missing a lot of the features we take for granted now but Championship Manager 2001/02 is the perfect combination of tactical bliss and faster-paced action. It’s also jam-packed with legends, from Zidane and Nedved to Beckham and Scholes, although the biggest star of them all is Cherno Samba, a cut-price teen who bangs in endless goals on his way to becoming best player in the world. In real life, he played around 50 games and scored around 15 goals before retiring last year. For a certain generation, Sensible World of Soccer is the be-all and end-all of football games. At first, it’s difficult to see why. The top-down graphics pale in comparison to modern efforts, and the action is alarmingly fast. But give it an hour or so and the gameplay will have you hooked, as will the surprisingly deep career mode. It boasts hundreds of leagues and clubs, and thousands of players too. In 1999, Michael Owen was one of most popular footballers in the world, leading England and Liverpool’s first line since scoring that goal against Argentina. A game bearing his name was almost inevitable. The game itself is pretty unremarkable, but the intro video will live long in the memory. In it, a young Owen stands in front of action from the game and utters the immortal words “Welcome to Michael Owen’s World League Soccer. Have fun” in the most deadpan way imaginable. It’s nothing short of hilarious. The fun doesn’t stop there though. When you win the league, you’re awarded with another Owen video. This time, Michael deadpans “Congratulations. You are now the world league champion” before mustering up enough enthusiasm to crack the tiniest of smiles. 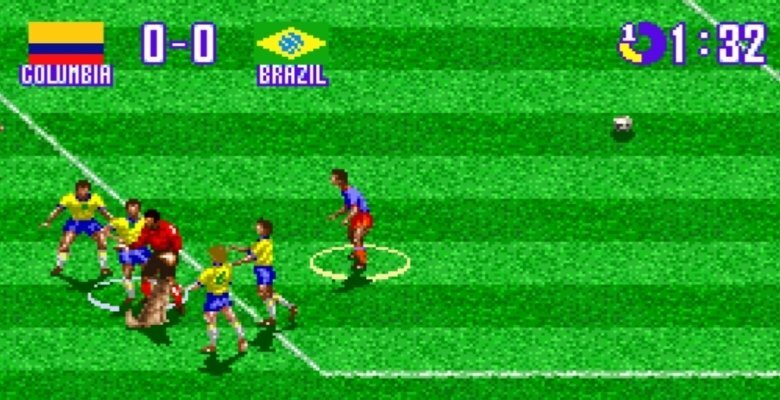 Before FIFA was the most realistic football series of them all, it was an arcade action fest in which matches ended 42-36 with at least 5 players sent off. FIFA 97 was the best of the early FIFAs, boasting loads of teams, official players and an indoor 5-a-side mode in which you could cannon the ball off the sides to make a pass. It’s not exactly realistic but it’s arguably even more fun than the modern editions of the game. What are your favourite football games of all time? Let us know in the comments! And if you’re looking for a retro fix, treat yourself and buy retro games from our huge range on the musicMagpie Store! Prices start from just £1.19 and you’ll get FREE delivery too. Click below to get started!